I’m doing a little bonus post this week! Yes, I normally post on Tuesdays and Fridays, but just for this week I’m throwing in one extra. Because who couldn’t use a little help like this during cold and flu season. And, besides…this mixture just tastes good! I’ve known about this little sore throat soother and cough remedy for years. I think my Mama even gave us something similar when we were children. You can keep a jar of this in your pantry or refrigerator and use it any time you start to feel that little tickle in your throat. You know that little tickle? The one that says “Get ready. I’m a nasty cold and here I come?” Yuck. I know people who swear that taking a spoonful of this Lemon, Honey, and Ginger Soother for Colds and Sore Throats every day will keep colds away. I don’t know about that, but some of them are pretty adamant about it. Now, I am NOT giving anyone medical advice here. I’m just sharing a little something that might make you feel better if you’re under the weather. And, by the way…don’t give this to infants. Honey is not safe for them. Guess what else? If you completely forget that this is in your pantry, after a while it turns into the most delicious marmalade! Yep. All you do is take a clean pint jar and cut up a couple of lemons and pack them into the jar. I take out the seeds, but whatever. About halfway through filling the jar with lemons, grate in about a 1-inch piece of fresh ginger. Finish filling with the lemons. Now, slowly pour the honey in giving it a little time to settle between all the lemon pieces. Put the cap on and let it sit for about 24 hours before you start using it. If you can get some local honey all the better. Most people stir a spoonful of the mixture into a cup of boiling water, let it steep a few minutes, then strain it and sip it. I actually prefer it in hot tea. And, if you’re really feeling under the weather, adding a little spoonful of whiskey won’t hurt a thing. 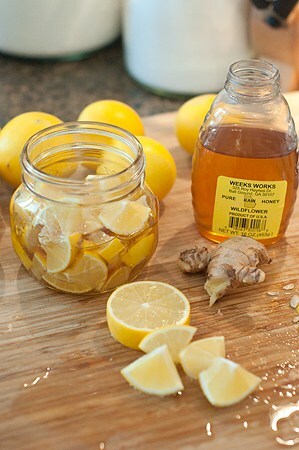 A lemon, honey, and ginger soother for colds and sore throats. Wash the lemon and cut into slices or wedges. Pack the wedges in a clean, dry jar. 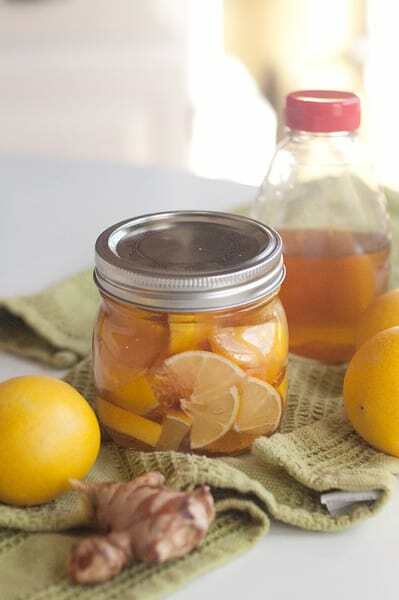 Grate the ginger root into the jar with the lemon wedges. Close the jar and let stand for at least 24 hours before using. Store in refrigerator or dark, cool pantry. If I feel really really really yucky, I use rum instead of whiskey. There is less taste, but you get the same sleep factor. Good idea! I’m going to try that. I’m touring with a children’s musical that requires me to wake up early every Monday-Friday for the next few months. Usually waking up at 6:00 am makes my voice stage a protest, and I kept finding myself with a sore voice when the weekend rolled around. I’ve been sipping this stuff with hot water on a pretty much daily basis, and I haven’t had a problem since. I’m pretty sure this will be a permanent addition to my fridge. Thanks! I am just wondering if you need to refrigerate this wonderful concoction? Jenn – refrigeration is not strictly necessary as honey and lemon are both natural preservatives. That said, however….I do keep mine in the fridge. I have never ever used ginger so with that said do i peel it or just use it as is? Tiffiney, the ginger is, of course, optional, but if you choose to include it you’d peel it and grate it into the mixture. We just made 12 jars today to give as Christmas presents to friends. What a good idea, Tim. I’ve never thought of giving it as gifts, but it would be so nice to receive a jar! We originally saw this recipe on Facebook. I googled and it led me to you. On the Facebook posting it said to refrigerate it. You talk of keeping it in the pantry. Does it keep well on a shelf unsealed? What would you say the “shelf life” is? You can keep it either way. Most people choose to refrigerate it. Even though honey is one of the world’s best preservatives (they’ve found it still edible in tombs in the pyramids), there could be some kind of contaminants on the lemon skin and refrigeration slows down bacterial growth. For that reason, most people would refrigerate it. Shelf life? I can’t say exactly but it’s a very long time. OMG. . . this sounds wonderful. I am going to make some for myself and it will definitely be in my Christmas goody baskets next year. I keep a jar on hand all the time, Paula. It just gets better and better with time. I saw this when you originally posted it. Today I need it. Thanks for the great idea and the re-post! Did I miss something? How do you use it, by the tablespoon? Add whiskey? Help! My husband need this. Yes MPW – as I said in the post, you can stir it into hot water, hot tea, add some whisky…or just eat it out of the spoon. Whatever suits you! Just received the whole article, so now I know how to use it. Thanks so much. I have always made a “tea” with these ingredients, one cup at a time. Now, to think I’ll have it on hand all the time?? Fantastic, thank you! I read somewhere that you are not suppose to mix honey with hot water or any liquid for that matter as the heat destroys all the goodness in the honey. Can anyone here confirm that to be a fact? You can pour a hot liquid onto honey and that will be fine. What you are not supposed to do is heat honey up along with a liquid b/c apparently that does destroy the beneficial properties of honey. I made this last night but it has not turned to a jelly consistency. Did I do something wrong? Tessa, this is not jelly. Please read the entire post carefully to understand the uses of this mixture. Depending on how juicy your lemons are, it could be fairly thin. It doesn’t really make any difference to the taste or effectiveness. You don’t have to stir it. How many times per day should you drink this? You can drink it as often as you like. It’s a beverage, not a medication. I’ve never tried it with agave. If I didn’t use honey, I would try pure maple syrup in it. I don’t believe maple syrup would have the high viscosity of honey so it wouldn’t coat the throat as well. Honey also has antibacterial properties and has been used for medicinal purposes for ages. Okay I’m gonna ask it. Do you the lemons and too with the rind on it? Sorry…. Do you eat the lemons with the rind on it too? You can if you want to. Usually, you just stir the honey into your tea or water…whatever. The lemon juice infuses into the honey and the honey into the lemons. You can just leave the ginger out. It will still work fine and will taste just as good. I could leave the ginger out but want to add it later. Do you think adding it to the honey/lemon mixture in weeks time would be alright? …..need to pick up more fresh ginger next shopping trip. Can this work with ground ginger instead of fresh ginger? If you don’t have fresh ginger, I’d just leave it out. I often make it with just lemons and honey. The ginger is just for a different taste. Made this the on Tuesday, and I used ginger in it. I was wondering how long do you leave the lemon in it or do you strain it and keep it like that? You can leave the lemon in it indefinitely. You store it with the lemon in it. hello I Love this omg I was wondering what does the ginger do? The ginger is just for taste. You can leave it out if you’d like. The ginger is really good for upset stomach. I added my mixture to some club soda and it was fantastic! Ginger is also very good for digestion and upset stomach….it has many uses…it is spicy if eaten so people should be aware of that if they try to eat it raw. I guess you could, but I don’t think it would taste very good. Especially when mixed with hot tea. Would this be good to flavor Tea? Yes, it’s very good in tea. I’m sorry, but I’m unsure what it is that you’re asking. Listya – it’s just a recipe. You can change it any way you want. As a person who gets a lot of sore throats all year round, I tried this mixture and it works so well. I just have a couple of teaspoons at a time, and it soothes my throat straight away, it also tastes amazing. I wouldn’t be without it. Thank you so much for posting this. So glad it helps you, Jayne! It can be stored indefinitely. Does anybody add cinammon to this? When finished the liquid, can I just add more honey?